In case it wasn’t immensely clear from my blog banner, I really really really love 1951’s The Day the Earth Stood Still. Like, really a lot. It’s quintessential classic science fiction, what with its aliens and laser-eyed robots. Meanwhile, the plot, dealing with the Cold War and nuclear weapons, falls squarely into a bit of history that tends to repeat (see: current day). Of course I’m human. Look, I have a briefcase. Like the humans do. Cause I totally am one of those. And, very briefly, I feel I should at least address that, yes, there’s a remake. I don’t hate the remake, and it definitely wasn’t as bad as I was expecting (shame on me), but it didn’t stick with me like the original version did. Often times I forget the remake exists altogether. It’s just sort of there, and that’s fine. 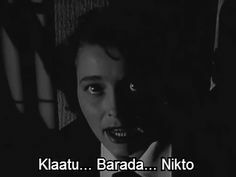 I’d also like to make it very clear that the phrase “Klaatu barada nikto” did, in fact, originate from 1951’s The Day the Earth Stood Still and NOT 1992’s Army of Darkness. That’s just a fact. And for this post, I will be looking at the original context. No offense to Sam Raimi, Bruce Campbell, or any of their fans. It was an homage when it was used in Army of Darkness. That’s the whole point. It did make me like Army of Darkness more, but please remember your good friend Klaatu when you next hear the phrase. Moving on! The phrase turns out to be a set of instructions. For most of the movie, Klaatu inexplicably speaks perfect English. This is never really explained, but I also don’t really spend a lot of time wondering about it (until now. Dammit! ), but he is from a different planet, which presumably has its own language. Gort, the giant robot, does not speak English. He doesn’t speak at all, actually, but he doesn’t seem to understand English. The only way anyone can communicate with him is in this alien language (and maybe some wavy hand gestures and flashlight speak on Klaatu’s part). The problem with bringing Gort along to Earth is he’s very shoot-y and very protective of Klaatu, and if he sees anything that seems to pose a threat, like, say, an army’s worth of tanks pointed at him only 10 seconds after landing on a foreign landscape, he will laser-kill you. Klaatu was clearly not expecting humans to act the way humans act and flip out and assume that alien presence = alien threat. 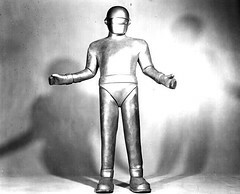 I wonder if Klaatu would still have brought Gort if he knew. Probably. For most of the film, Klaatu, who looks human, walks around the city, meets people, and decides for the most part they’re pretty okay. He definitely doesn’t want to blow Earth up, but he’s super confused about this whole war thing and why humans bother about it. To be clear, he walks around the city after being treated/captured by an army hospital that he was taken to because he got shot after being on Earth for, I think, less than 60 seconds. Like, he’s barely out of his ship. And then he has to escape from the hospital, because they want to do a bunch of weird tests on him. But he does have some human allies. There’s a little boy, Bobby, who sort of becomes Klaatu’s tour guide and then takes him home like a little lost puppy, and the boy’s mother, Helen, who helps Klaatu when it gets more dangerous and there are shoot-y people around. And there’s a scientist dude, but he doesn’t really have anything to do with this particular post. Anyway, Helen is trying to get Klaatu back to the ship, shoot-y people in pursuit, and Klaatu says something like, “well, this looks super bad, and I’m probably not gonna make it back to the ship, so I need to to do me a solid. Find Gort, and tell him ‘Klaatu barada nikto’, mmkay?” And sure enough (and spoilers, but the movie is over 60 years old), Klaatu gets shot. And dies. So Helen has to go find Gort and deliver the message. Now the full line she says is “Gort, Klaatu barada nikto.” And I think that “Gort” bit is actually significant. No one talks to Gort other than Klaatu for the whole movie. Until this moment, when a human speaks to him. But she addresses him, uses his name. It suggests that she knows him and understands something about him. And it manages to stop him from laser-killing her, which he very nearly does when he first sees her. Klaatu is dead. DO NOT SHOOT THINGS, especially the woman talking to you. As a matter of fact, go ahead take her into the ship (Side note: Klaatu’s ship is hella rad. And also appears to be bigger on the inside. Hmmm). She’ll be safe there. If she resists or doesn’t understand why you’re staggering towards her in a totally menacing way, go ahead and just pick her up and carry her inside. Next, go get Klaatu. Here’s the address (we don’t know where exactly Klaatu’s body was being kept (looks like some sort of prison cell), but Gort seems to know exactly where he’s going). Bring Klaatu back to the ship. Raise him from the dead. Then go into sleep mode. Zombie-Klaatu will take it from there. We’ll never know for sure. And that’s probably for the best. The words will live on. As words are wont to do. Cause it’s a nifty little sci-fi phrase to keep in your pocket. And as much as I hope the Force will be with you and that you live long and prosper, the last thing I’d like to tell you before I open the pod bay doors (Hal) and say so long and thanks for all the fish is Klaatu barada nikto. This entry was posted in film and tagged 1951, alien, army, barada, classic, darkness, day, earth, film, got, klaatu, nikto, robot, sci-fi, still, stood, translation. Bookmark the permalink. 15 Responses to What Does Klaatu Barada Nikto Actually Mean? What a great read! Thanks for the info and the fun! Loved the story. In the movie TRON (1982), the phrase is found on the side of Allen’s (Bruce Boxleitners) cubicle in the beginning of the movie. I just love these tie ins. Was also the names of jaba’s three skiff guards! Spot on man ! Love to send the robot to Washington DC he would be one busy boy !!!! . Just watched this movie! My Favorite because I was born in 1951! Google for information on this topic. “Esperanto”. An international auxiliary language devised in 1887 by Dr. Ludwig Lazarus Zamenhof (1859-1917), an eye doctor, under the pseudonym of “Doktoro Esperanto”. If you read the credits of the film you will see a credit for Esperanto dialogue used in the script as the alien language by the characters. It may be possible that “barada nikto”, can be translated into English. Because according to the film’s credits its “Esperanto” that is being used as the snippets, of an alien language. There is another longer passage of alien dialogue; where Klaatu is communicating by his ship’s radio transmitter with his home base; to set up the planetary electricity disruption that he and Earth’s Dr. Bernhardt (Sam Jaffe) have decided upon to demonstrate both the alien’s power and seriousness. The words “Klaatu barada nikto” translates to Klaatu (here) implement plan B. Plan B – Crew member request assistance. 2. Go to crew member. Since Gort is a robot, my guess is that it is code. A simple command like “ctrl,alt,del”, “find ./ -iname “index.php” ” or “(HCF)”. His name may be a password that lets the robot know the person using it is a trusted “user”. The rest is the command, opening up a file or triggering a set of other commands that prompted Gort to complete the rest of the more complex tasks. Or maybe I’m overthinking it. Loved both versions by the way.